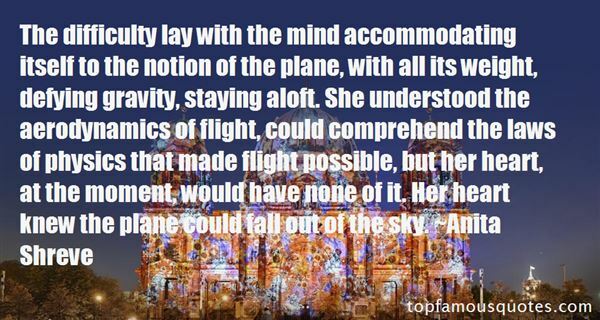 Reading and share top 7 famous quotes and sayings about Defying Gravity by famous authors and people. 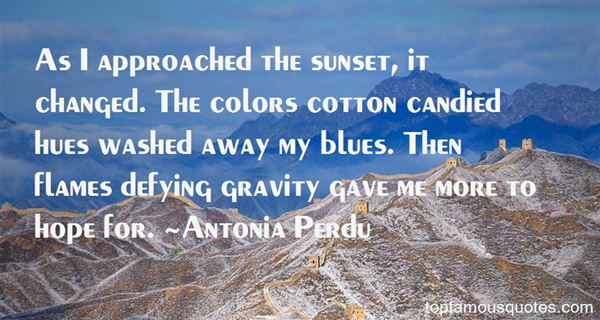 Browse top 7 famous quotes and sayings about Defying Gravity by most favorite authors. 2. "As I approached the sunset, it changed. The colors cotton candied hues washed away my blues. Then flames defying gravity gave me more to hope for." 3. "Jody noticed that the kid was focused on the breasts, which were defying gravity, and apparently death itself, by standing there at complete attention"
4. "You know you're my best friend, right?' he said.I shrugged. I guessed it was true. Now that I wasn't going to be at the parade, they would all hate me. Everything had been carefully choreographed, and me not being there would throw them all off. I realized that kids like Theo and me weren't supposed to have real friends. We were supposed to be all alone and confused. 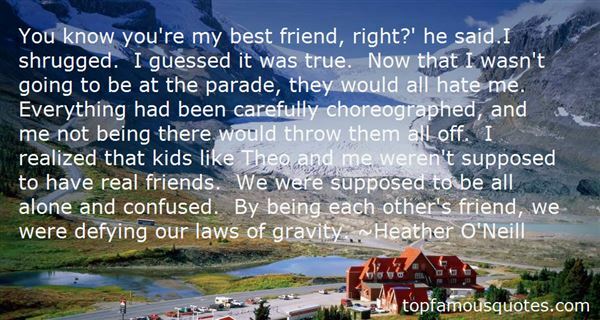 By being each other's friend, we were defying our laws of gravity." 5. "The wind picks up. It sends leaves scurrying for cover until a softer breeze blows through, settling them down again as if to say, Shhh, there, there, it's all right. One leaf still dances in the air. It spins higher and higher, defying gravity and logic, stretching for something just out of reach. It shall have to fall, of course. Eventually. But for now, I hold my breath, willing it to keep going, taking comfort in its struggle." 6. "The president is under 50 percent approval ratings in all the battleground states. So, you could say that President Obama is defying gravity by still being in a dead heat with Mitt Romney. And one of the reasons that he is, is because the changing face of the electorate are giving him a small boost." 7. "So if you care to find me/Look to the western sky/As someone told me lately/Everyone deserves the chance to fly!/And if I'm flying solo/At least I'm flying free/Tell those who'd ground me/Take a message back from me/Tell them how I am defying gravity!/I'm flying high defying gravity/And soon I'll match them in renown./And nobody in all of Oz/No Wizard that there is or was/Is ever gonna bring me down!/"
Man will become better when you show him what he is like."